I don't know what to say about this. This Mike guy is both a genius and an a-hole. He has a "Hacks for Life" YouTube page that appears to promote a scheming slacker lifestyle. 20-year old me might've cheered; whereas, 40-year old me hates him. In the video below he claims to have gotten into Opening Day 2014 at Dodger Stadium, received a Dodger Dog, a Beer and a game ball all for FREE. Wha....? Check out what I mean below. Is this guy for real, or is this a gigantic setup? Frankly, I think it's an elaborate ruse, so the jokes on me (or, all of us). Besides, that beer and game ball scam he pulls is like asking to get punched in the face. UPDATE: How much you wanna bet that this is an preview for a new "Larry David style" sitcom featuring a slacker living his life of luxury. After all, there's definitely some cringe-worthy stuff here. I'm Still Shaking and in Awe! Holy Moly! Kings Won the Series! I'm still in a daze. My mind is numb from last nights dizzying victory that capped off an amazing first round knockout of the San Jose Sharks. Most would have written off the Kings after they lost the first three games of the series. Heck, my pregame posts that typically root for the Kings had disappeared after Game 3. I just couldn't muster up the energy, and I feared my depressed state of mind would come through in my writing. That doesn't mean that I didn't believe, though. I still thought we had a chance. That deep within my flag-waving heart, the Kings could still pull out a victory. As we witnessed, the Kings played with heart, conviction and poise. They knew that what had unfolded was on them, and it would be up to them to make it right. They didn't complain about bad refereeing, or sulk around feeling sorry for themselves. Instead, they retooled their game, fixed their deficiencies and played like the kind of club we had hoped we'd see during the first few games of this series. Unlike the Sharks, they got better as the series went on, and now they find themselves headed towards Round 2. I want to add, that last nights victory was due, in large part, to the efforts of Kings goalie Jonathan Quick. With the game still tied at 1 a piece, he came up with an incredible save midway through the second period. If not for this save, I dare say that the outcome of the game may have been different. Watch the highlight below. For more video highlights from the game go here. Well... The rivalry game every Southern California hockey fans has been hoping for is finally happening. The Kings will face off against the Anaheim Ducks, and it all starts this Saturday. It promises to be an epic showdown. Last night, I got together with my season ticket buddy to snag a couple tickets for Game 1 and 2 in Anaheim before prices skyrocketed - today, prices are almost double what they were yesterday. So, I'll be rooting for the Kings live for the first 4 games of the series. 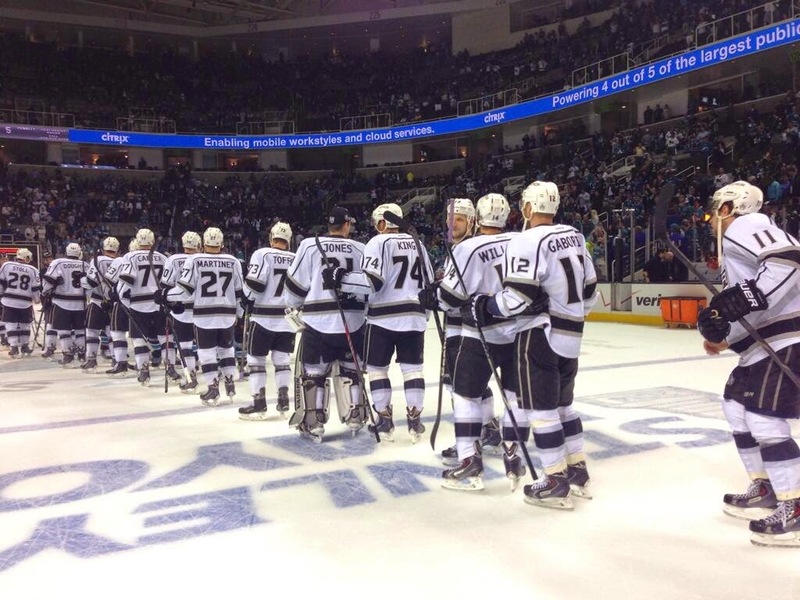 The photo at the very top via @LAKings on twitter. Did you ever have an opportunity to visit the Newport Sports Museum? It opened in 1995 and housed over 10,000 significant game-used artifacts representing every sport imaginable. Principally owned by John Hamilton, it represented the relationships he built throughout the sports world. Recently, the museum closed for good, and this month local sports memorabilia auction house SCP will begin auctioning much of its content. This is part 1 of a 4-part offering through SCP Auctions. BTW, you can still check out their website (here) as they continue to share photos and videos of the museum. 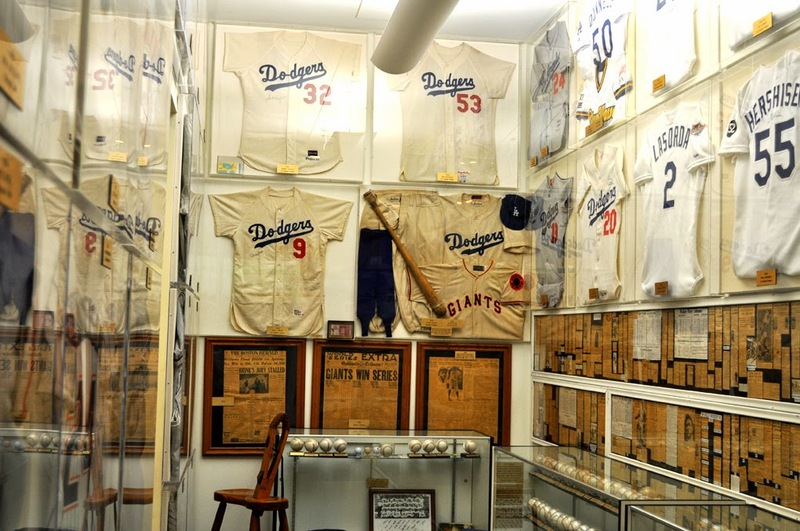 Below is a photo of part of the Dodger collection that was there. Below are some Dodgers related memorabilia that struck my fancy. 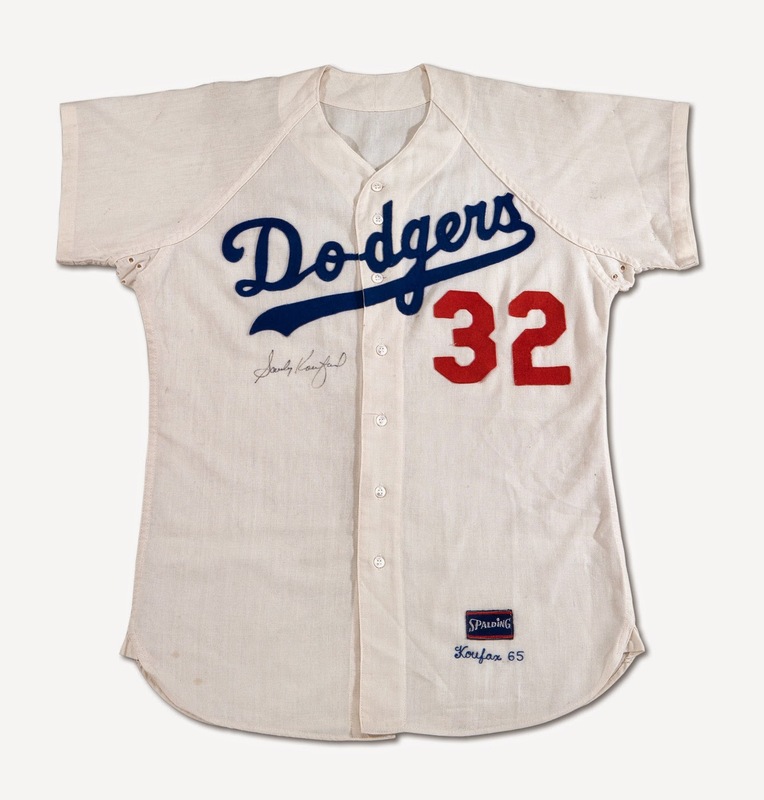 Game-used jersey's of Sandy Koufax (as well as most older Dodgers) are exceedingly rare. Below is a 1965 jersey he once wore. 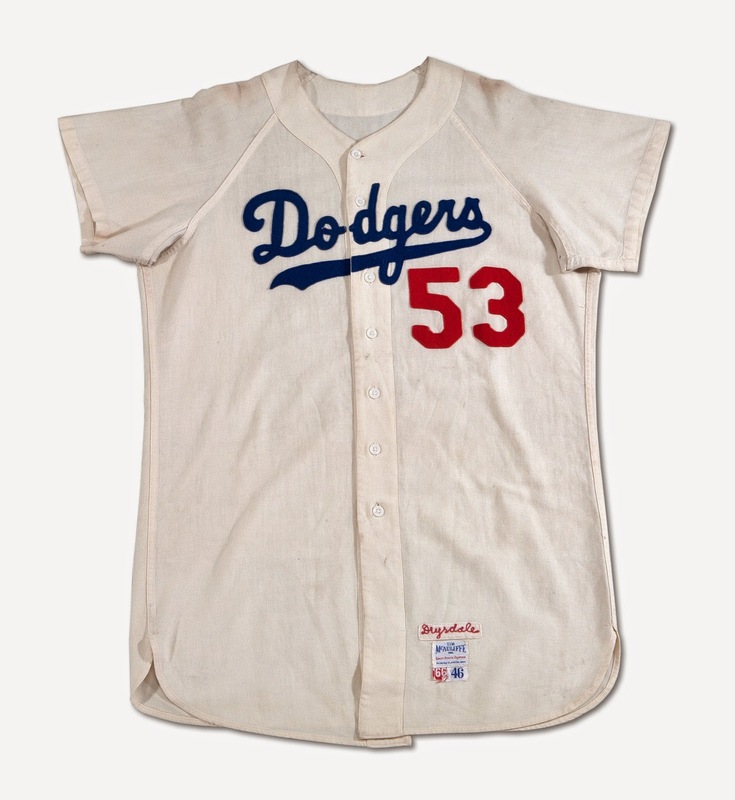 Below is a 1966 game-worn jersey of Don Drysdale. This is probably my favorite Dodger collectible in this SCP auction of Newport Sports Museum items. 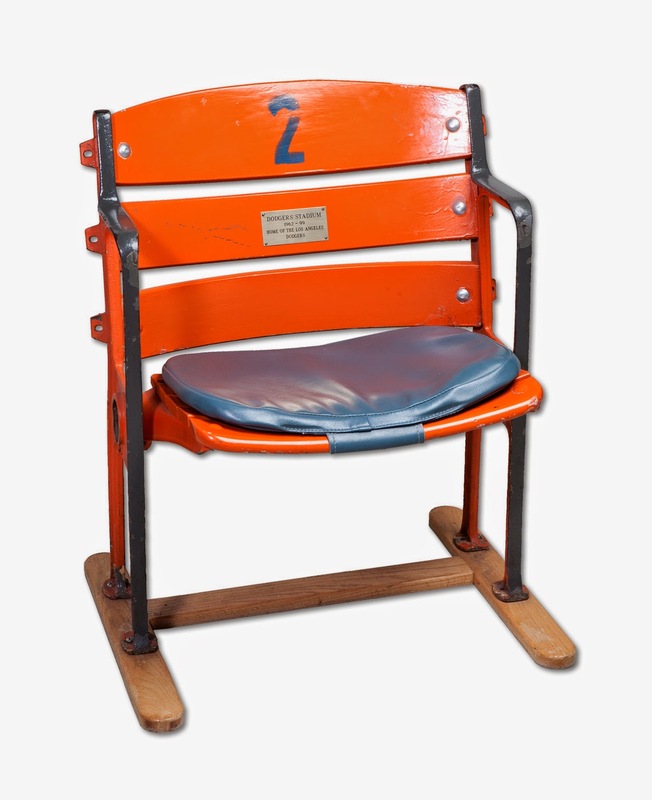 Below is an original Dodger Stadium seat that is said to have been removed during the renovations that occurred in 1999. Welcome to the Blue, Red Patterson! The Los Angeles Dodgers today selected the contract of right-handed pitcher Red Patterson from Triple-A Albuquerque and designated Albuquerque outfielder Nick Buss for assignment. Patterson, who will wear No. 51, was added to the roster as the 26th man for today's doubleheader at Minnesota and will make his Major League debut in the second game. Patterson has gone 1-1 with a 4.15 ERA in four starts this season with the Isotopes, last pitching on April 24 at Fresno and allowing five runs on nine hits in 5.1 innings in a loss. The 26-year-old has gone 33-12 with a 3.40 ERA in 132 games (58 starts) in five minor league seasons after he was selected in the 29th round of the 2010 First-Year Player Draft out of Southwestern Oklahoma State University. Patterson has 432 strikeouts, while walking only 148, in 440.0 career minor league innings. The Texas native made his first appearance in Major League camp this year as a non-roster invitee and allowed only one run in 11.2 innings (0.77 ERA), going 0-1 and limiting opponents to a .146 batting average (6-for-41). “I’ve never been able to throw a real curve, so I came up with the spike, basically digging my fingernail into the ball,” Patterson said. “It doesn’t move 12-to-6, but more 3-to-9, but even then it sometimes moves different ways. The above quote is from 2011, so I am unsure if this pitch is still in his repertoire. 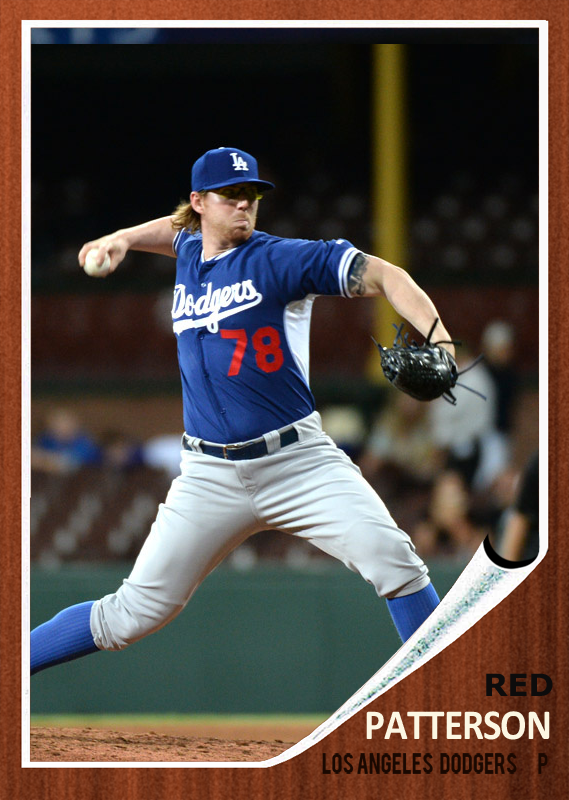 In celebration of Patterson officially becoming a Dodger and playing in his first Major League game later today, I made the above fantasy card for him. I used a photo grabbed from Jon SooHoo/LA Dodgers 2014 taken during his appearance in an exhibition game against the Australian National team in Australia and the 1962 Topps Baseball card design. 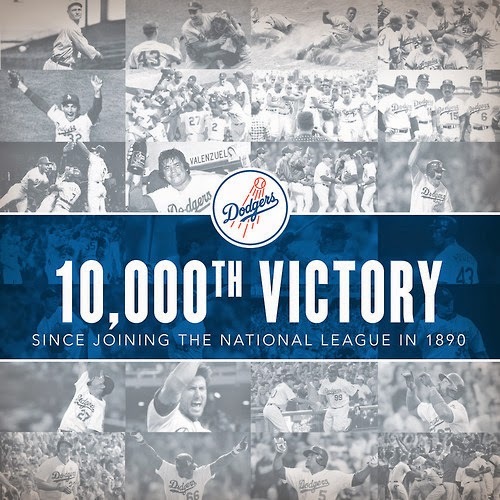 Blog Kiosk: 5/1/2014 - Dodger Links - 10,000 Wins! Last nights win against the Twins make it 10,000 franchise wins since joining the National League. Graphic above via Dodgers on tumblr. Bill Chuck at the Daily Gammons has more details, as well as, an explanation of some of the discrepancies regarding the Dodgers true win total. Via Cary Osborne at Dodger Insider, "Dodger minor league report: Week 4 — Starting pitching power." Eric Stephen at True Blue LA puts together a minor league report, as well. Via Jon Weisman on Dodger Insider, "The ballad of Hee Seop Choi." I do remember when Choi destroyed Twins pitching 9 years ago - If only he could have done that consistently versus other clubs. Via Chris Olds at Beckett tells us about, "Topps’ latest wall art series takes a look back at vintage MLB logos." 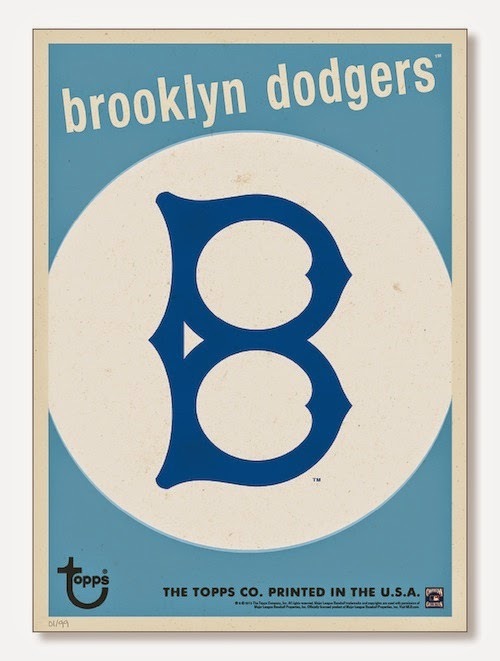 It includes a great looking Brooklyn Dodgers logo superimposed on a vintage 1959 Topps Baseball card. See it on the right. They are limited to just 99 copies. Via Eric Stephen at True Blue LA, "Clayton Kershaw throws 5 innings in rehab start in Chattanooga." "I think it went alright. I got my pitch count up there. With 87 [pitches], I would have liked to get through six or seven, but the goal was to get the pitch count up there," Kershaw told reporters after the game (per the Lookouts). Via Mark Simon at ESPNLosAngeles.com, "Greinke rolls through April again." An old friend alert: Via Steve Adams at MLB Trade Rumors, "At Least Five Teams Showing Strong Interest In Hanrahan." I'm actually surprised somebody hasn't thrown the Dodgers name in there - just for the heck of it.